The president has been criticized for his prolonged silence and for then making an allegedly callous statement to one of the widows. 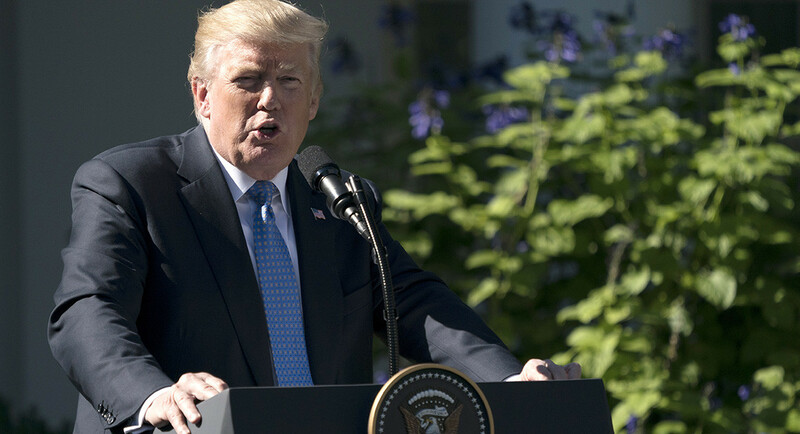 A staffer at the National Security Council drafted a statement of condolence for President Donald Trump to make almost immediately after a deadly incident involving U.S. soldiers in Niger earlier this month. But Trump never issued the statement, and, some two weeks later, is now in hot water over his initial silence on the soldiers' deaths and alleged controversial comments he made to a widow of one of the dead. "Melania and I are heartbroken at the news that three U.S. service members were killed in Niger on October 4 while providing guidance and assistance to Nigerien security force counter-terror operations. We offer our deepest condolences to the families and friends of these brave American soldiers and patriots. They will remain in our thoughts and prayers. "We are also praying for the two U.S. service members who were injured in the incident. We wish them a complete and swift recovery. "The heroic Americans who lost their lives yesterday did so defending our freedom and fighting violent extremism in Niger. Our administration and our entire nation are deeply grateful for their sacrifice, for their service, and for their patriotism." The statement was circulated among NSC officials as well as Defense Department officials. But it was never released, and it was not immediately clear why. NSC spokesman Michael Anton declined to comment. The NSC staffer who wrote the original draft hung up on a POLITICO reporter who called to ask about it. For 12 days, Trump stayed silent on the deaths, which ultimately numbered four, even though White House officials said he'd been briefed on the matter. White House press secretary Sarah Huckabee Sanders did address the deaths during a press briefing on Oct. 5, saying the administration's "thoughts and prayers are with the families and friends of the fallen." On Monday, Trump was pressed during a news conference about why he had not spoken publicly about the deaths. He defended himself by saying he'd written to the deceased's relatives, and then falsely claimed that former President Barack Obama and other past presidents had never or rarely called the families of U.S. troops who died. Meanwhile, some outside observers, such as former Defense Secretary Leon Panetta, suggested some of the blame lay on Trump's staff. "Somebody screwed up here, okay?" Panetta said, according to The Washington Post. "You don't let that amount of time pass when our men and women in uniform have been killed." The controversy over Trump's treatment of the issue has since snowballed amid allegations that he spoke callously to the wife of one of the fallen U.S. troops, Sgt. La David T. Johnson, during a phone call on Tuesday, the same day she greeted his body at the airport. According to people who listened to the call on speaker, Trump said something to the effect of how the late sergeant knew what he had signed up for, but that it hurt regardless. On his Twitter account Wednesday, Trump denied saying anything inappropriate in the call, and has been publicly feuding with a Democratic congresswoman who accused him of being insensitive to Johnson's widow.